Leading economic indicators predict where the economy is headed. A prime example of a leading indicator is the stock market. Stock prices take into account investor expectations. High expectations produce higher prices while dashed expectations lead to sell-offs. Interest rates and yield curves have predictive value, as do foreign-exchange rates and raw materials prices. The Census Bureau’s durable goods and housing starts data are other examples of leading indicators. Durable goods data gauges heavy industry strength and demand for items designed to last three years or more. Housing starts see a pick up in activity as the business cycle expands. The Conference Board, a not-for-profit organization that identifies peaks and troughs in business cycles in the U.S and eight other countries around the world, releases a Leading Economic Indicator (LEI) series considered the industry standard. Coincident indicators define where the economy is right now. Examples include industrial production figures compiled by the Federal Reserve Bank, construction spending and new home sales tracked by the Census Bureau, along with manufacturing and trade sales and retail sales. Personal income, consumption and retail sales are monthly barometers of where the consumer fits in relation to the current state of the economy. The Bureau of Labor Statistics releases inflation data on both the wholesale (producer price index) and retail (consumer price index) level. The Conference Board considers some of this activity when calculating its coincident economic indicator and releases this data along with its monthly LEI series. Lagging indicators show how the economy has performed. The two most widely followed pieces of the economic puzzle are both rear-view mirror depictions of economic activity while garnering the most attention. The unemployment rate is calculated by the Bureau of Labor Statistics (BLS) and released in its monthly Employment Situation Report on the first Friday of the month. The data covers the preceding month and includes the number of jobs created or lost as a coincident indicator and average hourly earnings and average hourly work-week, a leading indicator. The quarterly Gross Domestic Product (GDP) report comes from the Bureau of Economic Analysis (BEA) and represents the market value of all goods and services produced by the economy during the period measured, including personal consumption, government purchases, private inventories, paid-in construction costs and the foreign trade balance (exports minus imports). The data is for the previous quarter and is subject to revision. The most recent report showed the U.S. economy contracting at an annual pace of 6.2% in the fourth quarter of 2008, compared with a 0.5% third quarter contraction. Conventional wisdom defines two back-to-back negative quarters of growth as a recession. LEI และ CEI ใช้ทำอะไร ? LEI และ CEI สร้างมาอย่างไร ? We still see the two spikes from last year – the first in August 2009 and the second in November 2009. To understand the chart, I should explain that the Google Trends data is relatively scaled. This means that each point is presented relative to the average over the time period (12 months). 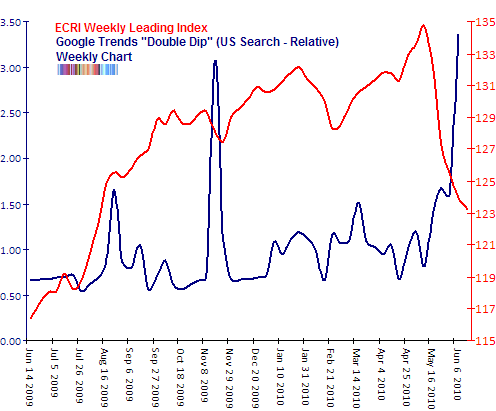 So the most recent data point from last week at 3.38 means that searches for “double dip” last week were 3.38 times that of the average for the past 12 months. The second spike, showed that people had significantly more concern in mid-November 2009. This was more expected because it was a result of some weakening in the LEI. This brings us to today’s scenario. The current spike easily surpasses the last one but it comes as a result of a total collapse in the LEI. 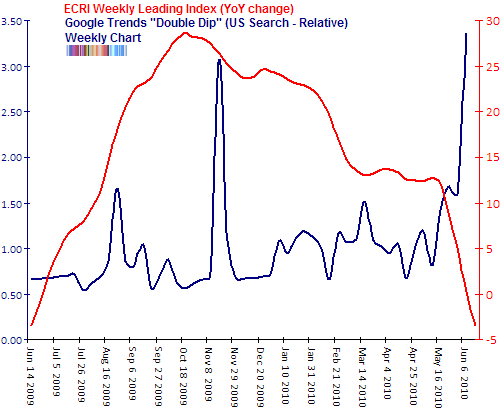 In fact, we’ve never seen the ECRI LEI fall quite this rapidly. Considering the precipitous fall those dizzying heights, you would be forgiven if you expected all hell to break loose in sentiment. 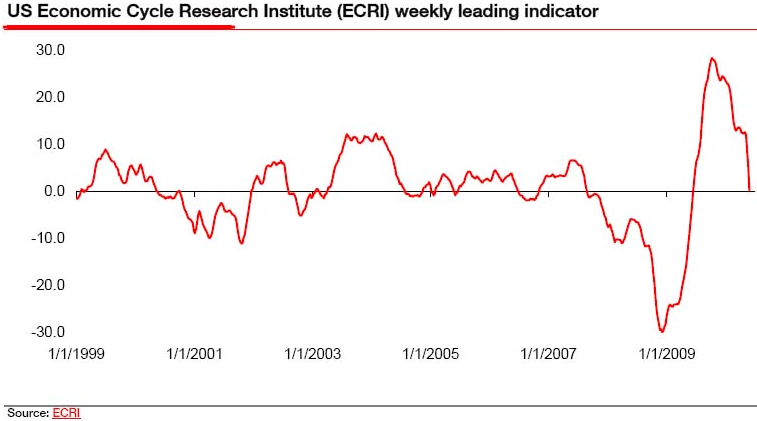 But all in all, our (flimsy) proxy for sentiment has not shown a concomitant rise.